As the year nears its end I thought it would be a good time to post word about the Wainwrights in Colour project and the progress of the forthcoming book and of course to wish you all a very Happy Christmas! Firstly I must thank everyone for their patience, especially those who have already bought the print and book package. It was fully my intention to have the book printed and launched before now but sadly this has been delayed due to unforeseen circumstances but mostly down to the fact that I have realised the project has become a real obsession to me, those who have been following my blog on the Andy Beck Images website will have read how I risked life and limb just to look at a rare flower and how on another occasion I had to revisit more than one location just to confirm that I had the correct reference for the required sketch and these details needed clarifying before the project could be completed. The list of fells for me to complete grows ever shorter and once the sketches are finished they are scanned, adjusted and then the images are digitally inserted into the layout of the book. The design process has been a real learning curve for me, and the task of fitting all 1500 sketches into the pages, as near as possible in scale and wherever possible in the correct order that they appear in the Pictorial Guides. 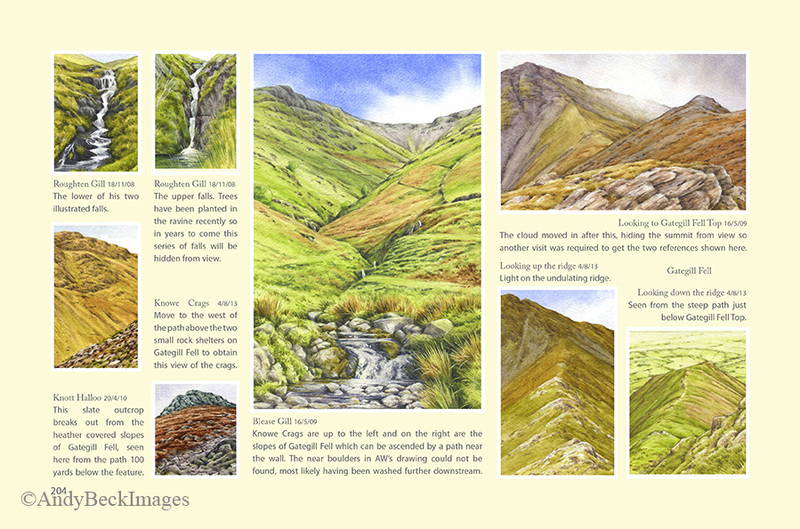 One of the Blencathra pages. Sketches and text in place ready for proof reading. Gray Crag, the five sketches here fit neatly on to one page, prior to proof reading. As I have been working my way through the 350 pages of the book I have found that the content needed more than just simply a little sentence of text describing how each scene has changed since AW’s day. Consequently I have spent quite a bit of time researching extra details about features, history of the landscape and relevant facts connected to the series of the Pictorial Guides. I have also been able to source previously unpublished images of Wainwright at least one of which I plan to use in the introduction. 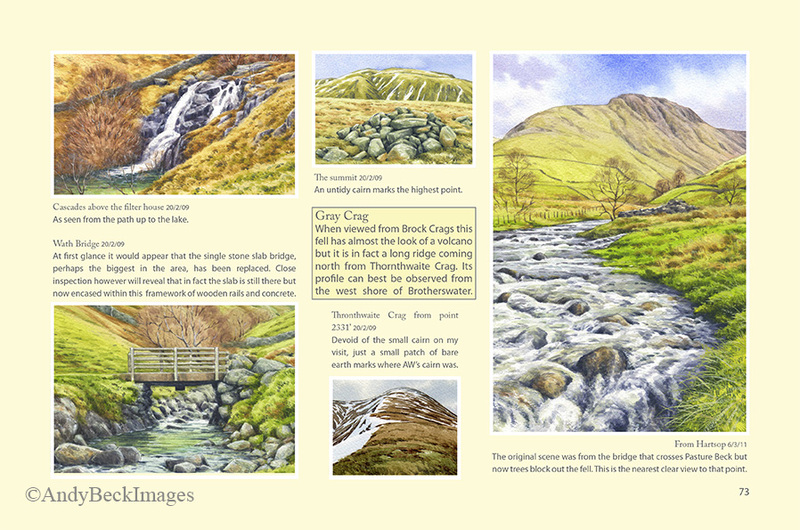 Much of this extra information I hope to use throughout the Wainwrights in Colour book to make it more than just a collection of watercolour sketches of the lakeland fells. Perhaps the biggest thrill for me has been to be able to access the original archive material of Wainwrights at the Cumbria Archive Centre in Kendal. 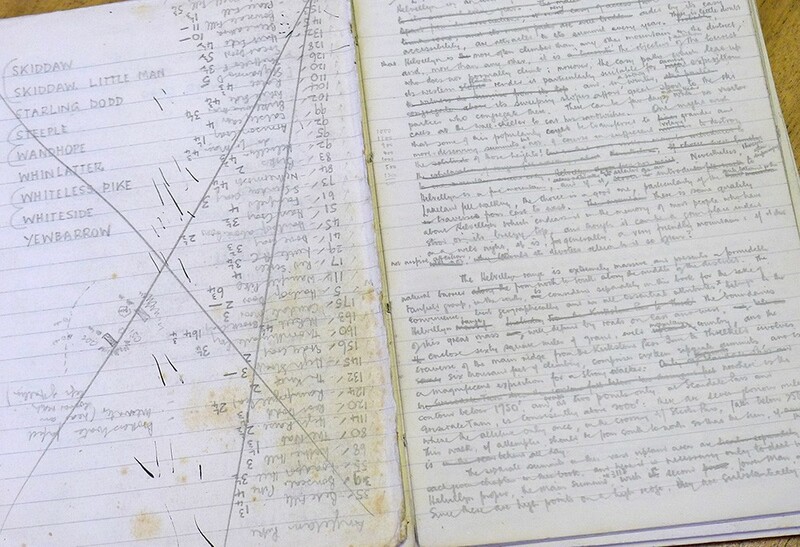 To actually closely scrutinise his manuscript, notes and photographs has given me an invaluable insight to his methods of work and hopefully I will be able to impart some of this detail through the pages of the book. I feel that the extra time taken to get the Wainwrights in Colour completed and published has given me the good fortune to make what would have been an interesting book even more of a opportunity to publish a much more informative and polished work. As for publication. 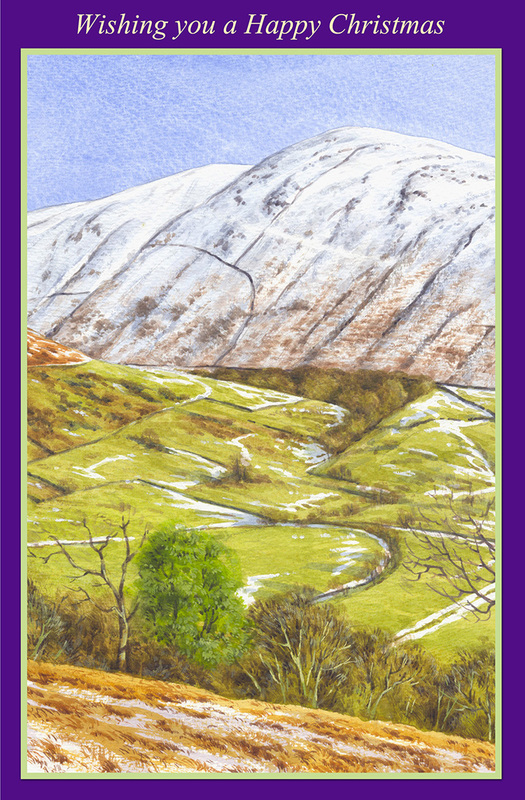 The intention is to now launch the book in the Spring of 2016 (one year later than previously intended), a date which will meet very neatly with the 50th anniversary of the publication of Book 7, The Western Fells. There is no fixed date as yet but as soon as I have one no doubt you will hear about it. The intention is to have a book launch weekend to be held at a suitable venue in Kendal which will consist of an invite only evening followed by a open launch on the Saturday and Sunday where the film of the project will be shown and I will be able to answer any questions and sign copies of the book. I have already been asked to have other events throughout the area so in the near future I will publish a calendar of dates. I must make clear that even though I now receive regular emails for people asking to go on the list for a copy of the book there is still only ever going to be a one off print run of 5000 copies of this book, there will not be a second edition or print run- ever! Each copy will be signed and numbered and will include a DVD copy of the final edit of the film. If you are one of the many people already on the list for a copy of the book then you should have received an email about this blog post. If you have not received such an email and would like to be added to that list then please email me at : info@andybeckimages.co.uk with your details. If you know of others who may be interested than please share this post with them. Once again, I thank you all for your continued interest and patience. I only have one opportunity to publish this book and my intention is to make it as near perfect as possible, both for you as a reader and for me as the artist. Have you any idea of the cost of the completed edition? Also is it possible to order more than one copy? Thanks for the update, Andy. I’m happy to be patient, know it will be worth the wait! Thank you for the update Andy, I am so looking forward to the finished book but the longer it takes the more exciting it will be. I just hope I am one of the lucky 5000 to receive a copy. Thank you Don, you will not be as excited as I am. Don’t worry as you are on the mailing list you will be one of the first to be notified of the publication date and then be able to pre-order. Pleased to hear the book is nearly completed ,I’m sure it will be worth the wait.hope I am lucky enough to own a copy.